I was eager to dine at Spring House in Winston-Salem after seeing Chef Tim Grandinetti on Food Network’s "Challenge" and "Chopped," and sampling his Ostrich concoctions at Fire in the Triad. The restaurant is in a 93-year-old white house, which is grandiose, complete with an inviting patio and outdoor water fountain. Atmosphere aside, I have to admit that while I loved a few of the dishes I sampled, I was definitely underwhelmed with others. We were seated upstairs in a room with 3 other tables, which made for a noisy evening. Not knowing the restaurant layout, I would have much preferred to sit downstairs where the doors and windows were open, letting in some of this refreshing cool air we've been having lately. Instead, we were confined to the little room, and had frequent and appreciated service check backs, though it took an uncomfortable amount of time to receive our food. 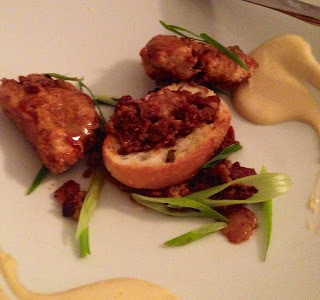 I devoured General Tso’s Crispy Veal Sweetbreads with Ham Jam, and once again told my mom to Google it AFTER our dinner. The Ham Jam was more like a garnish than a jam - salty and crispy bites sprinkled around the dish. The Sweetbreads were served on French bread rounds, with Hot Mustard Sauce drizzled around the plate. The sauce lacked heat, but gave a nice, creamy element to the appetizer. Seeing other tables with bread, and not anticipating as long of a wait for food as we ended up having, we asked our server for a basket. I was a bit confused when I was told they serve bread as a course, and that it would be $5. It wasn't listed on the menu as an appetizer or shared course, but we said we’d take some. My fingers were starting to look tasty at that point. Unfortunately, the bread never came, and we had to ask for it to be removed from the bill. The Bahnson Burger (named for the prior tenant) was the most outstanding entrée of the evening. Topped with Country Ham, Pimento Cheese, Crispy Onions and a slightly sweet Tomato and Saffron spread, this is one of the most flavorful burgers I've tasted in quite some time. Served with Yukon Gold Potato Chips, sprinkled with Seasoning Salt, this is one dish that you shouldn't look over. There are certain words I consider food magnets. Truffle, White Chocolate, Scallops, Red Velvet – chances are, if the dish contains one of these words, I’m going to have to try it. 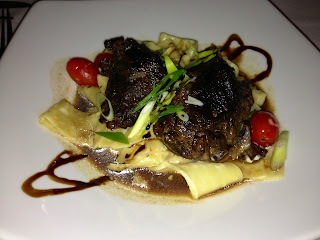 Kobe Beef, being one, I couldn’t resist the Slow Cooked Kobe Beef Cheeks. The consistency is like that of a ridiculously tender Pot Roast – I almost couldn’t pick up a bite with my fork. While the meat was awesome, I was pretty disappointed in the accompaniments. Asparagus Tips (cut so small it was difficult to pick one up), Mushrooms (all 2 of them) and Cherry Tomatoes decorated Pappardelle Pasta. It needed a good dose of salt. In fact, I had to salt it twice before finding it pleasurable to eat. Chef Grandinetti’s Shrimp, Tasso Gravy and Grits is different than what you’d expect, but in a good way. The Tasso Gravy seemed Tomato-based, bringing an unexpected sweetness to the dish. It’s a huge pet peeve when shrimp dishes arrive with the tail intact – dipping your fingers in a large bowl of Gravy Grits to tear off a shrimp tail isn’t what I’m looking to do. Being that it was my birthday dinner, I was pleased when a free dessert was offered. 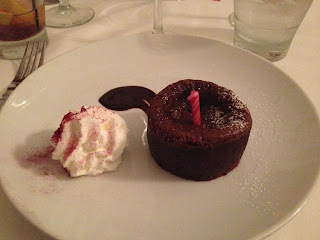 Again, pet peeve, I would have appreciated the option of selecting my own, but instead was presented with the Babysitter Cake, which is more like a Chocolate Mousse with a fondant center, accented with a fresh Hibiscus Cherry Infused Cream. It was actually pretty sublime, though very rich. I would return to Spring House, with the opportunity to sit downstairs or outside. There are many other dishes on the menu that intrigue me, but will be very disappointed if my expectations are once again not met. I'd like to go back for lunch sometime soon. I'd like to see how the lunch menu compares..
DR. BROWNSTONE’S PORK & CHEDDAR “TOASTIE”? I'm interested. It would definitely be the perfect day drinks spot. I'm equally as interested in that bread pudding.